Snæfellsnes is a 90km long peninsula jutting out to the west of Iceland, at the end of which sits Snæfellsjökull – a dormant, glacier-capped volcano – made famous by Jules Verne in his Journey to the Centre of the Earth. 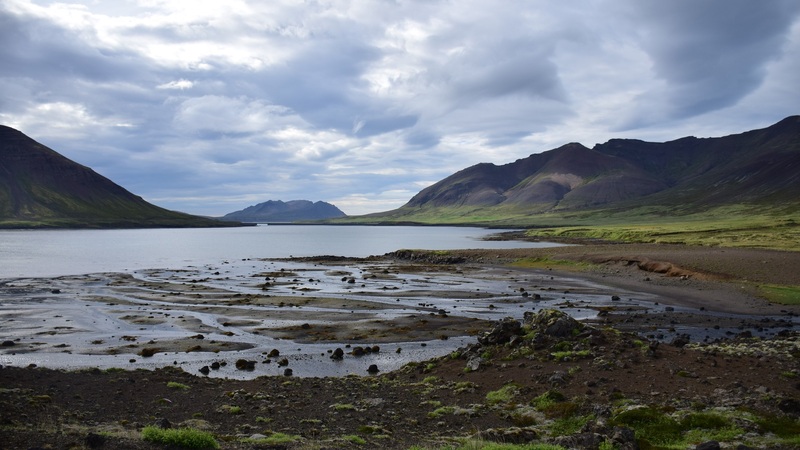 As a destination, it is comparatively less well known than the more famous Golden Circle, Blue Lagoon or Lake Myvatn. However, it is described as “Iceland in a nutshell” for good reason. 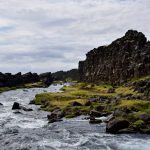 The region has a spectacular glacier of the same name, mountains, lava fields, caves, waterfalls, seascapes … everything you came looking for. Snæfellsnes was the last leg of our Iceland trip, and it can be done in a 2 day trip from Reykjavik too (or even 1 day in cinch). 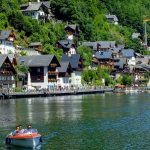 There is no large town in the entire peninsula, only a series of small villages. Like the rest of the country, very little by way of human habitation in Snæfellsnes, and there aren’t many farms to be seen either. So it felt more raw and wild than whatever we had seen before. We drove in from Blönduós, and stayed the first night at Freezer Hostel (http://www.thefreezerhostel.com/) in Hellissandur, which was quite excellent – and my first hostel stay since my student days. The second night was at Laekjarkot Rooms in Borgarnes, which was the only bad hotel in our entire Iceland trip. The rooms are trailers/containers converted into 2 tiny bedrooms with a kitchenette, and are starved for space. Our peeve was non-functional hot water supply – the gas heater would trigger the fire alarm!! I would recommend you steer away from the place if possible. 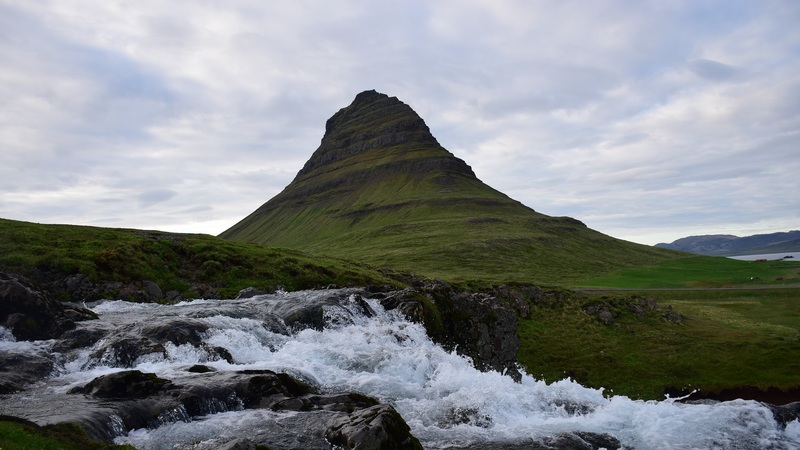 In an island packed with geographical attractions, the solitary mountain of Kirkjufell manages to stand out – literally! Jutting out into the Atlantic Ocean, it looks phenomenal surrounded by water on three sides, and it supposed to be the most photographed venue in Iceland. Kirkjufell has gotten more fame recently, as the Arrow Mountain in S07E06 (Beyond the Wall) of Game of Thrones. The best spot to take a photo, is of course, next to the Kirkjufell waterfall, with the mountain in the background. 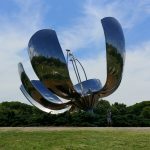 And you cant miss the spot – just lookout for photographers with their large DLSRs and tripods. After the night in Hellissandur, we started the day with some spelunking at Vatnshellir cave – or rather, lave tube. A lava tube is a tunnel formed when lava solidifies on the top, but continues to flow below it. Once the lava flows out, an empty channel is left. There are probably thousands of such lava tubes in Iceland, but very few are known, because there is no way of discovering them unless the roof caves in. Vatnshellir is one such lava tube and is situated just 10 km from Hellissandur. It can be visited, but with qualified guides, and in tours, as it extends 35 m below the ground and is pitch dark and freezing inside. The tours are done by Summit Guides (http://www.summitguides.is) – who are really enthusiastic about two things 1) Caving and 2) seeing imaginary Icelandic trolls in all corners of the cave. The interior of the cave is stable throughout the year at 0 deg C. The entrance isn’t much, a very small circular metal shed in a small cavity by the side of the road. The Summit Guides folks give you helmets, torches and tell you repeatedly to watch your step inside, because if you fall down, you might break some delicate lava formations – though lava rocks, being quite sharp, can more than take care of themselves …. 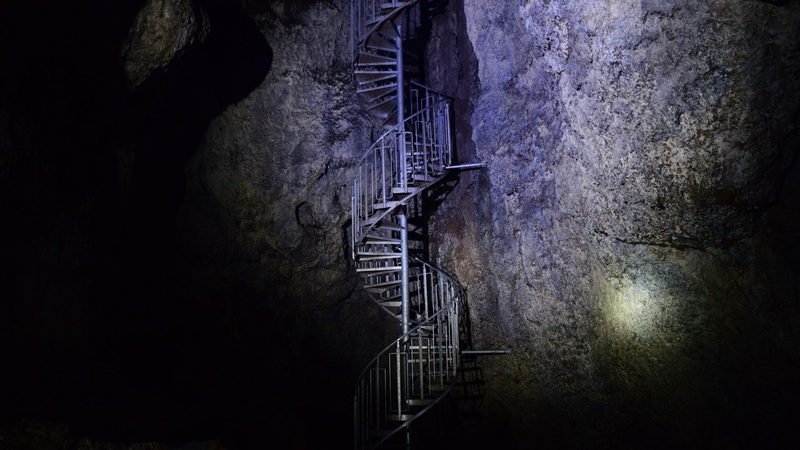 Once we negotiated the twin helical staircases and reached the bottom of the cave, our guide made us switch off all our torches and experience full darkness for a minute (for me the first such experience). It is quite something to not have a hint of any light – you can strain your eyes as much as you want, you see absolutely nothing. The whole cave experience is quite short, 40 min or so. So if you are visiting Snæfellsnes, this is a fun and unique activity to put on the list. 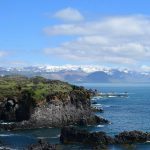 From Vatnshellir, Lóndrangar is just 2 min away, and the beginning of a spectacular coastline of Snæfellsnes peninsula, with cliffs giving way to the Atlantic ocean. The rocks are volcanic black, and they are littered with seagull nests on ever nook and cranny. Some parts of the black cliffs have turned white from all the bird droppings. 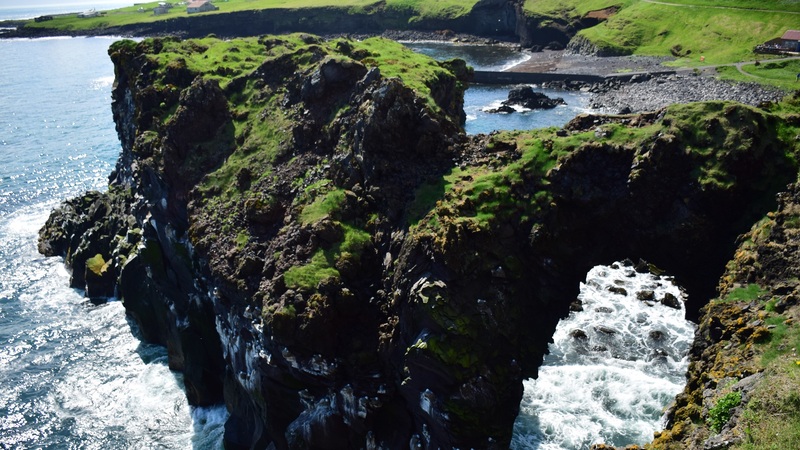 A further 6 km away is the small village of Hellnar, where the sea waves have carved out an arch in the cliffs. The frothy white waves below, and the green top of the cliffs make for a picturesque setting like no other. 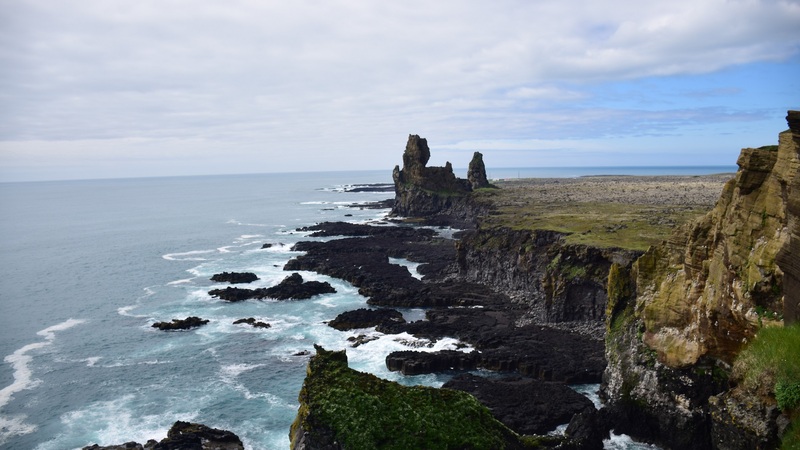 There is a well worn 2.5km walking path to the next village of Arnarstapi, which follows the beautiful coastline and is definitely worth the time. However, we were a bit short of time, so we jumped into our car and drove down to Arnastapi. 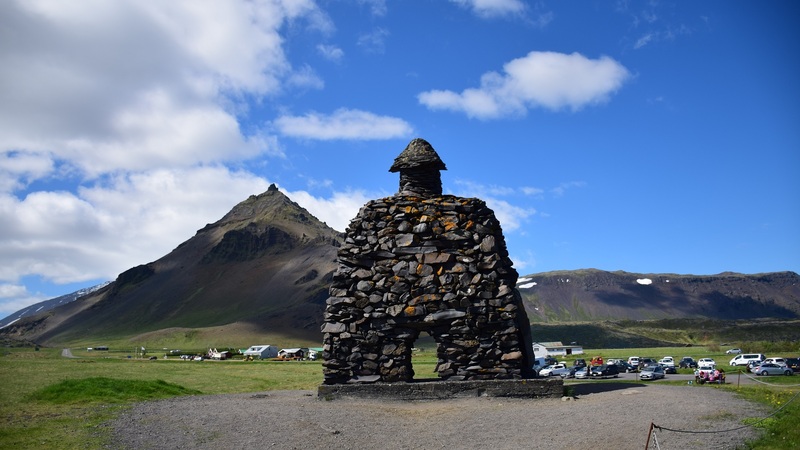 Standing guard at Arnarstapi, is a large sculpture of Bárður Snæfellsás, the deity of Mr. Snæfell. 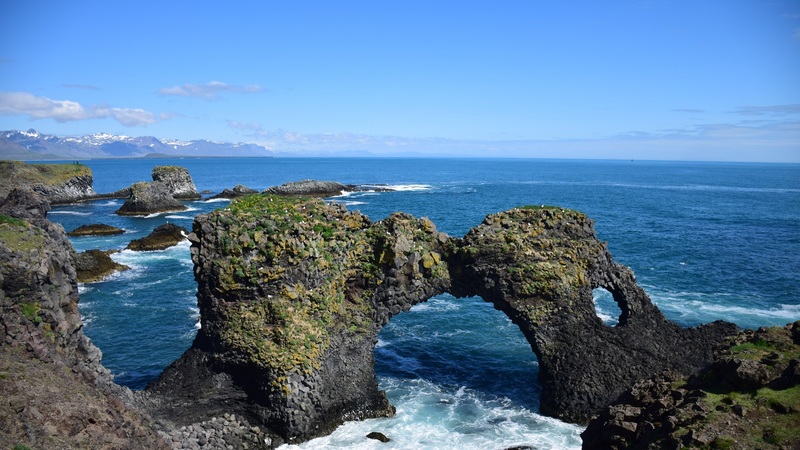 The cliffs at Arnarstapi look as stunning as Hellnar, and there is another natural arch formed by the waves called Gatklettur, which acts as a perfect backdrop for beautiful photos. The road from Arnarstapi continues hugging the coast, making for some spellbinding views. Somewhere on the road on the left, we saw a couple of vehicles parked next to a narrow cleft in the rocks on the cliffs. 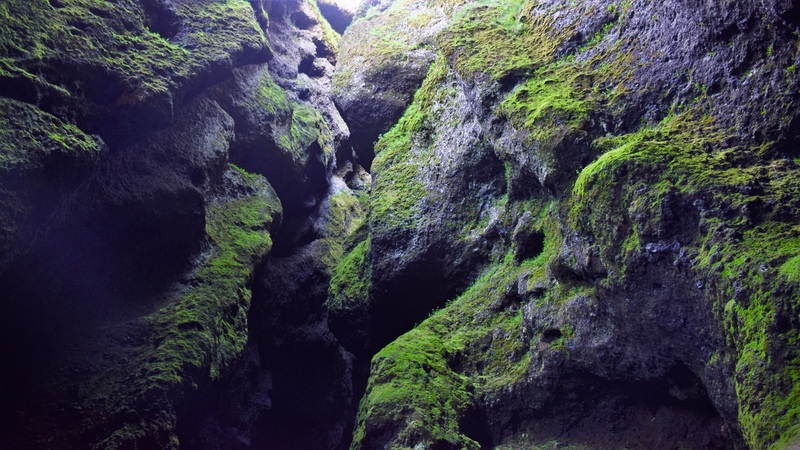 Turned out the narrow ravine had a name – Rauðfeldsgjá Gorge. A small stream flows at the bottom, but if you don’t mind getting your feet, it is navigable quite a bit inside – (or at least thats what the information board outside said). Again, we were on a bit of a schedule, so we didn’t explore it beyond a few metres, but we would have loved to. Visible from Rauðfeldsgjá Gorge is a stretch of golden beach below. 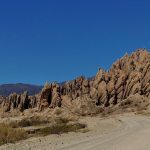 We hadn’t heard of this place before, but once we had seen it from afar, we had to check it out. Turned out to be a small golf course with no clear access path to the beach. But we weren’t to be denied, and we just walked across. And we were repaid with a beautiful golden sand beach – the only one we saw in Iceland. 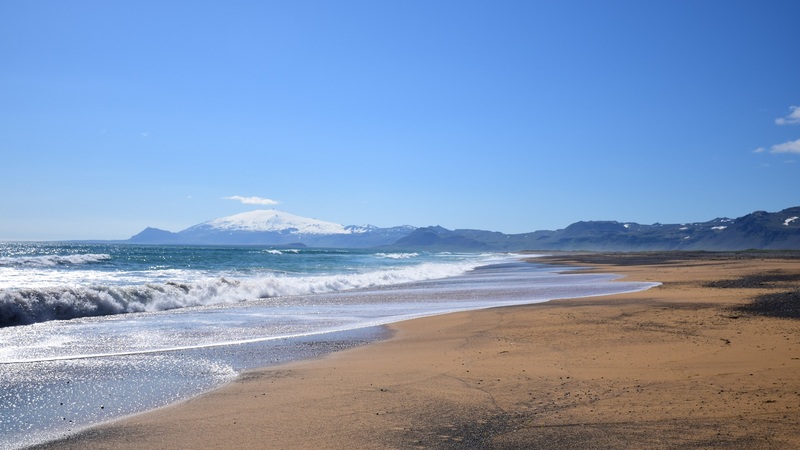 With snow-capped Snæfellsjökull at one end, it is a really pretty beach. Of course, the frigid waters of Atlantic Ocean makes most of the typical beach activities impossible. We stayed for a while, enjoying the sharp wind from the sea and the sand beneath our feet. With the day almost up, we had time for one more stop. Close to Borgarnes town are the cliffs of Gerðuberg. 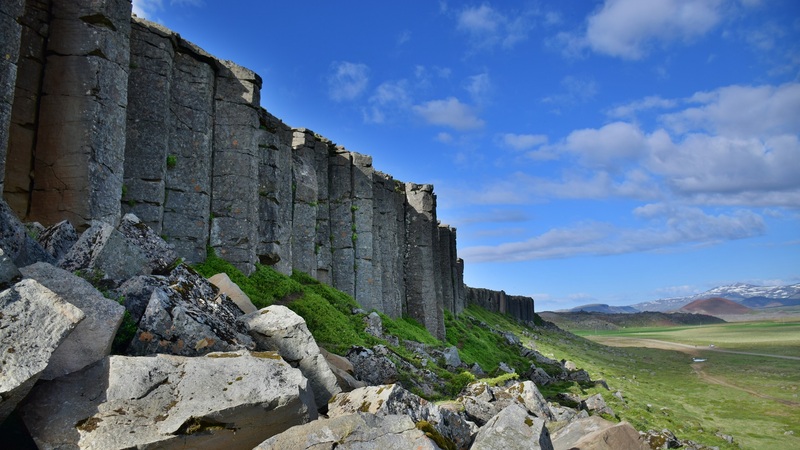 The columnar basalt gives impression of man-made fort/castle walls – no matter how many times I look, cant shake off the feeling that it is too straight to be natural. Snæfellsnes has one final delight for us, before we left for Reykjavik. The weather was beautiful with the sun out as we drove to see Hraunfoss. 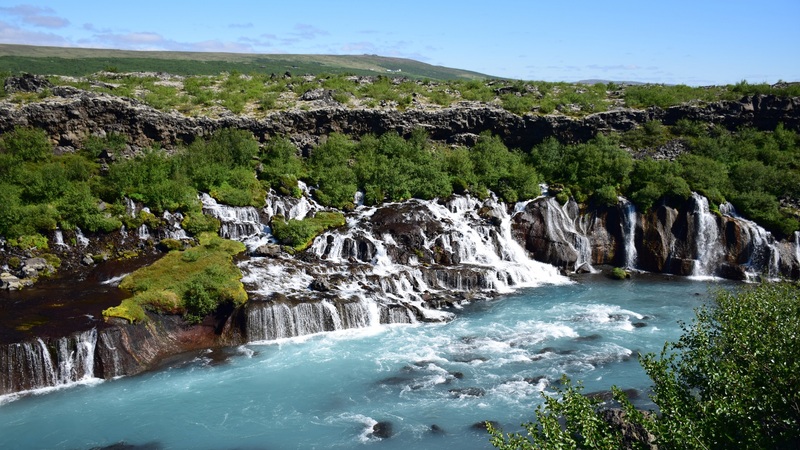 And even after seeing countless big and small waterfalls, Hraunfoss took our breath away. The waterfall seems to flow straight out from inside rocks – into the turquoise colored Hvita river !! It isnt an illusion, the water is travelling through porous lava rocks below the ground, before falling off the cliff. 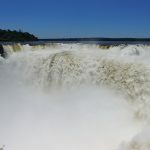 The nearby Barnafoss is more of a cascade rather than a full waterfall. There is a bridge across Barnafoss, which is dedicated to children who fell into the river and lost their life.